Chicklet can’t stand water, unless she’s drinking it. She won’t go outside when it rains and walks around or hops over puddles. And besides the time he fell into the pool, Fraiser doesn’t seem to have any special affinity for water either. 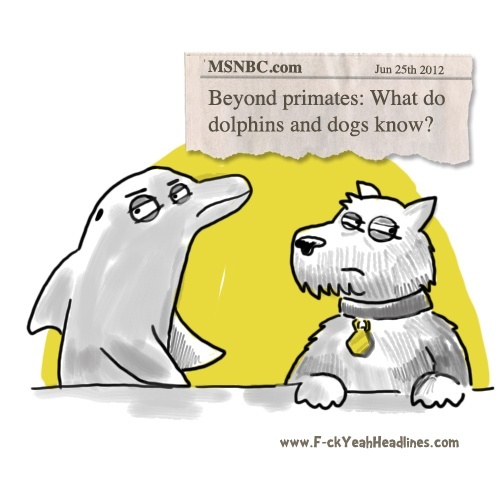 So when I read about this pup who loves swimming with dolphins, I was seriously amused. Kira, whose owner is the founder of the Somente Aqua Dolphin Center in southeast Africa, happily jumps into the water and paddles around with the other dolphins. In fact, I think the dolphins actually like having her there. How neat is that?